Preppy Pig is a successful BBQ catering company in the Northeast region that is outgrowing their production. Currently, their need for bbq and spice rub is greater than their commissary production. The idea is to bring their local, all natural BBQ sauce to a Manufactured co-packer for foodservice and retail sale. 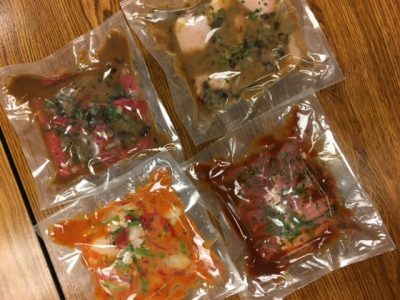 Focusing on the texture and flavor of their current quality homemade sauce; Preppy Pig was able to work with Chef Services Group to breakdown retail ingredients and create a manufactured product. The overall goal was to bring the Preppy Pig Sauce Line to the retail market. The secondary goal was to provide a BBQ Rub spice blend and food services pail sauce for their catering company use. Their need was the creation and implementation of a matching but cost effective, BBQ sauce that fit into the sourcing specifications. They needed to be an All Natural and Organic Product with local origin to maintain their product identity as well as remain whole foods/trader Joe compliant. They wanted to be a simple Label for a product that personified Preppy Pig BBQ. The Preppy Pig Company is a great fit for Chef Services Group; Utilizing their years of manufacturing and product development experience they were able to help produce a matching line of clean labeled Preppy Pig Sauces & Seasoning Rubs that stay true to the Preppy Pig Culture. The Sauces utilize only all natural and harvest friendly ingredients to provide a clean label perfect for marketing towards a Whole Foods Market or Trader Joes Market.